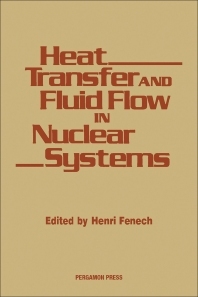 Heat Transfer and Fluid in Flow Nuclear Systems discusses topics that bridge the gap between the fundamental principles and the designed practices. The book is comprised of six chapters that cover analysis of the predicting thermal-hydraulics performance of large nuclear reactors and associated heat-exchangers or steam generators of various nuclear systems. Chapter 1 tackles the general considerations on thermal design and performance requirements of nuclear reactor cores. The second chapter deals with pressurized subcooled light water systems, and the third chapter covers boiling water reactor systems. Chapter 4 tackles liquid metal cooled systems, while Chapter 5 discusses helium cooled systems. The last chapter deals with heat-exchangers and steam generators. The book will be of great help to engineers, scientists, and graduate students concerned with thermal and hydraulic problems.